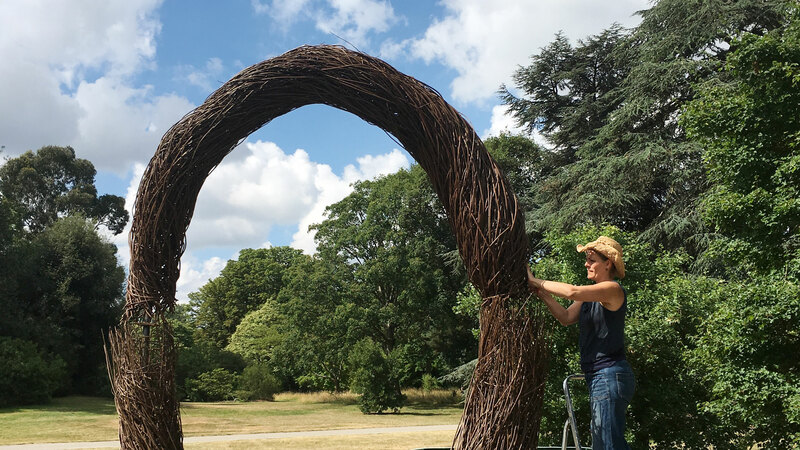 Julia Clarke creates sculptures for indoor and outdoor spaces. She works with willow, both dried and living, with wire, steel, paper, and ceramic. She states that her work comes from a place of having to make, "I’ve always needed to make…be tactile, touch, play and create in 3D. I’ve tried to communicate what I need to say, even if I’m not always sure where that is coming from." She has always been fascinated by scale, tiny natural forms, giant abstract shapes, vessels, woven forms, seed pods, nests. The tension between materials, how things join together, weave, entwine and lock together to create forms with a life of their own. She is responding in a way that creates something from nothing, transforming the discarded, unnoticed, or unseen to something large and present. Using her hands, repetitive movements, and physical hard work are all key elements to the making process. When making larger scale work she wants the viewer to respond directly, they can climb into the work, or really want to, but can’t. Natural materials and environmental concerns are a key element in her work; she seeks to be as light touch as possible. She enjoys making work that "controls the way the viewer sees and responds to the space". She endeavours to connect with the viewer and engage them in responding directly with the art work.